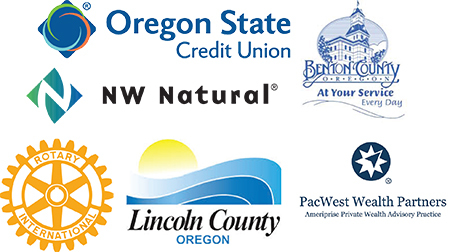 OCWCOG, the Oregon Cascades West Economic Development District (CWEDD), the Oregon Cascades West Area Agency on Aging (CWAAA), and our Alliance partner – the United Ways of Linn, Benton, and Lincoln Counties – brought together more than 100 local community, business leaders, regional stakeholders, and elected officials on September 13th to its Celebrate Linn, Benton, and Lincoln (CelerateLBL). The event offered an opportunity for the Region for community, business leaders, regional stakeholders, and elected officials to celebrate the excellence within the Region. The event was held at the Oregon Coast Aquarium. Community Partner of the Year – Oregon State Credit Union, received this award for their ambition and commitment to serving communities, while developing and strengthening our Region. From their lending work to their philanthropic mindset, the Credit Union puts the Region and its citizens first. “The Credit Union and the work of the local Council of Governments complement each other in so many ways that further our community investments in these three Counties,” said Oregon State Credit Union Assistant Vice President Mike Corwin in accepting the honor. Project of the Year – City of Lincoln City and The Bijou Theatre, for its partnership between the City and the Theatre to create a tourism hub for the City. “This award is a perfect example of working together with our City as a team to create a great outcome for everyone. We would not have succeeded without the help of local resources the City offers to businesses to grow and thrive. This 80-year-old Lincoln City institution is looking forward to the next 80 years,” said Keith Altomare, owner of The Bijou Theatre. Citizen of the Region – Mike Volpe, a dedicated volunteer for senior and disability services, received this award, for his advocacy work over the last several decades on behalf of seniors and those with a disability at the local, State, and Federal levels. His commitment to fighting for the rights of and healthcare needs of Oregonians is unparalleled. “Thank you for this award. I would like to recognize the COG staff, the volunteer DSAC [OCWCOG’s Disability Services Advisory Council] and SSAC [OCWCOG’s Senior Services Advisory Council] members, and most of all the home care workers that work with me that enable me to volunteer my activities,” said Mike Volpe. Chair’s Award – T. Gerding Corporation, OCWCOG Board Chair recognized the T. Gerding Corporation for their impact to the City of Albany, as well as to the Region. Specifically, in Albany, Gerding built the new state-of-the-art police station, new downtown fire station, and constructed the historic Albany Carousel. Volunteer of the Year – The Honorable Catherine Skiens, former Linn County Commissioner, received this award for her many years of service to our Region, her commitment and perseverance in all she takes on, and her long list of impressive accomplishments. Meals on Wheels Volunteer of the Year – Carol Dorning, a long-time Meals on Wheels volunteer, received this award for her incredible community spirit, giving nature, and selfishness for those she serves through the Meals on Wheels program. For more information about the Region Award winners, CelebrateLBL, and to view pictures from this year’s event, visit www.CelebrateLBL.org. Next year’s event will be held in Linn County; more information will be available soon.